PITTSBURGH — Ketel Marte‘s two-out single in the 13th inning led the Arizona Diamondbacks to a 2-1 victory over the Pittsburgh Pirates on Friday night. In the top of the 11th, Jake Lamb scored from second base on catcher Elias Diaz‘s wild throw. Diaz fielded Marte’s two-out chopper and threw to the foul side of the first-base bag for a two-base error. Diamondbacks LHP Robbie Ray (strained right oblique) is scheduled to make his third rehab start Monday, pitching for Triple-A Reno. … RHP Randall Delgado (strained left oblique) made his third rehab appearance for Reno on Thursday night and allowed two runs, one earned, and one hit in 1 2/3 innings with four strikeouts while throwing 34 pitches. He had pitched a combined 2 2/3 scoreless innings in his first two games. 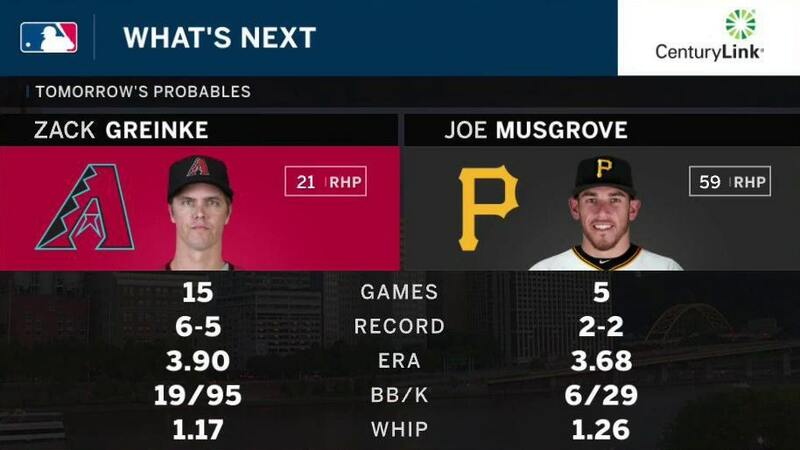 Diamondbacks RHP Zack Greinke (6-5, 3.90 ERA) is 3-1 in four June starts despite a 4.63 ERA and 7-4 with a 4.91 ERA in 12 career starts against Pittsburgh. Pirates RHP Joe Musgrove (2-2, 3.68) is 0-2 with a 6.46 ERA in three starts in June.